On the second day of our California Vacation, we headed to Universal Studios. With buy one get one day free tickets, we still had two full days to enjoy the park. 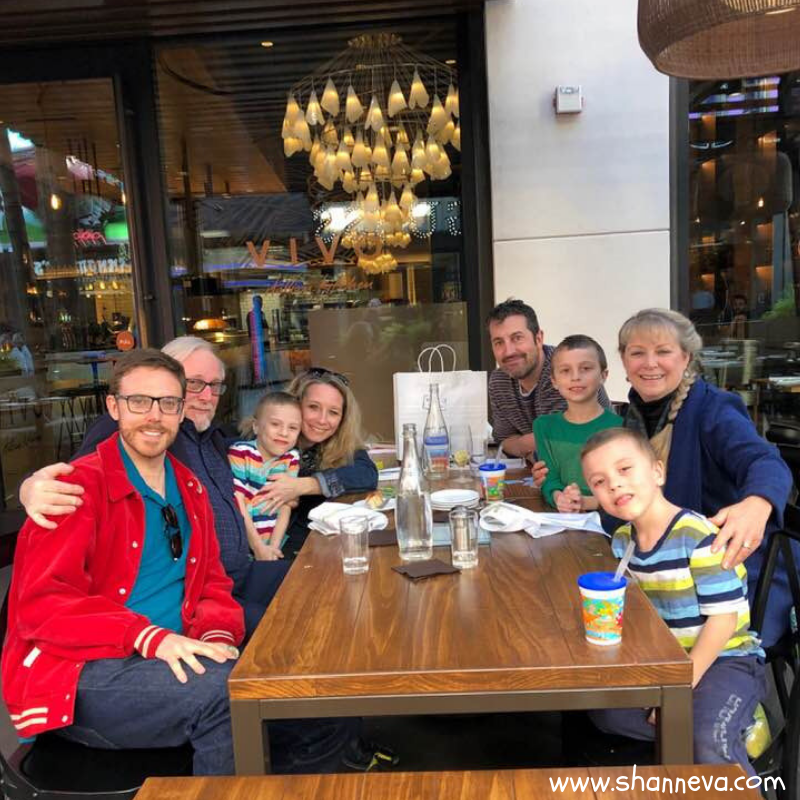 We would relax and take our time, after recovering from our long day of travel and visit to Citywalk. There was just one problem. Remember that two hour time difference? My boys certainly did. They were up at 4 am! We got them to sleep for a little longer, and then watch TV as we waited for the breakfast area to open. Our hotel had free breakfast, and since we were up so early, we were the first ones there. It was a really nice set-up with eggs, fresh fruit, cereal, bagels, and coffee. I brought a back-pack with me for the theme parks because I knew you could bring snacks and water in to both Universal Studios and Disney. We stopped at a convenience store on our walk to the park, and loaded up with two large bottles of water, chips, granola bars, and fruit snacks. Remember to add the Universal Studios’ app to your phone! It allows you to see wait times, show times, and height requirements for all the rides. It was super helpful. Now, off to the park! 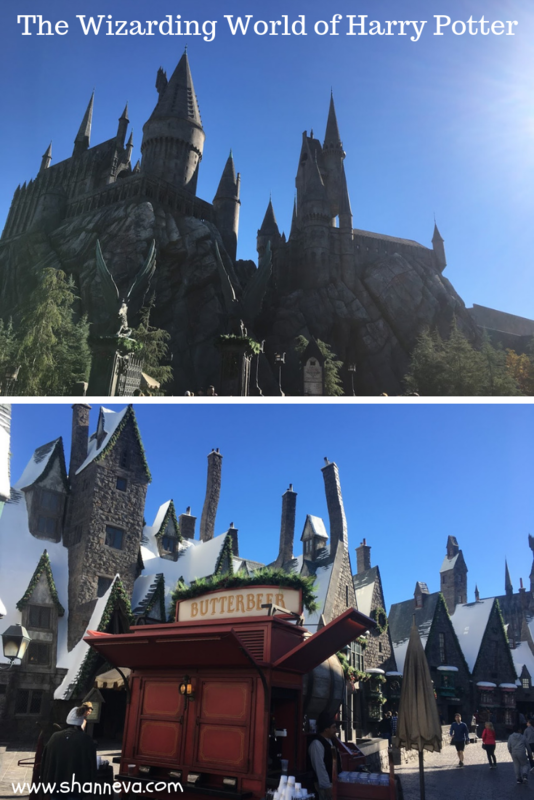 We got to Universal Studios right when it opened, and headed directly to The Wizarding World of Harry Potter. It ended up being the perfect choice because it got really crowded later on. We noticed a few people in costume, the boys got to take a picture with a train, and look at the giant castle you see everywhere. Even though I’m not a huge Harry Potter fan, it was pretty neat to just look around. When it gets dark, they have snow. Hollywood made, fake snow. Not a huge deal to us Wisconsites, but it is pretty novel to see while wearing a t-shirt. Mr. B and my husband rode on The Flight of the Hippogriff first to make sure it was OK for everyone. The twins were tall enough to ride (39″) with an adult. You have to be 48″ to ride it alone, as with most of the rides in the park. Mr. P still didn’t want to go on. So, after the first two went, I took Mr. C on it. I’m not a huge fan of roller coasters. In fact, I’m very scared of them. I just can’t do the big drops. Luckily, there aren’t really any drops on this one. It just goes very fast and loops around. Plus, it’s only about a 20 second ride. I think that was about 19 seconds too long for Mr. C.
So, if your little one isn’t good with speed or fast turns, I’d take a pass on this one. 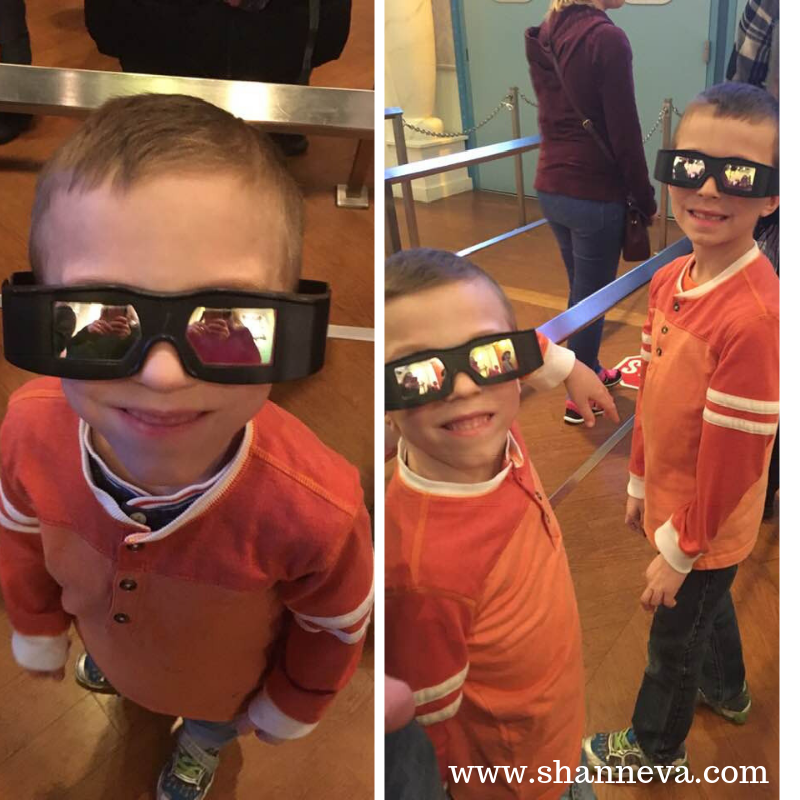 The twins were not tall enough for Harry Potter and the Forbidden Journey (48″ minimum) which was a virtual reality ride. It’s still a lot of motion, even though you really aren’t going anywhere. Mr. B and my husband enjoyed it, but Mr. B did find it a little scary. 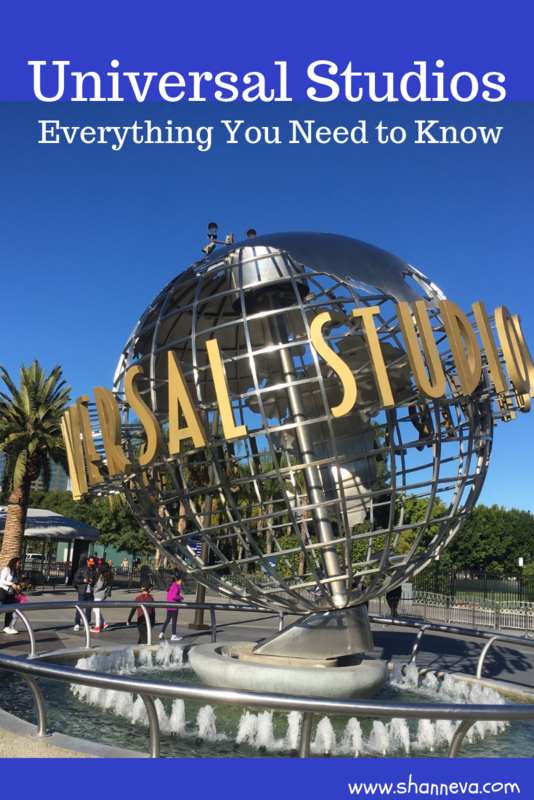 When I was a young, single kid, I used to work at Universal Studios as a tour guide. So, I wanted to make sure the boys got to experience the backlot tour. Even though it’s a little different now (Jimmy Fallon does part of the tour on a TV screen in front of the tram) there was still a lot that was the same. Jaws attacks, the old streets of Mexico get flooded, and you still experience an earthquake. There’s more virtual reality, a new version of King Kong, and the addition of the Fast and the Furious, instead of Dante’s Peak. The Psycho house is still standing, but we were all disappointed we didn’t see anything from Back to the Future. The tour runs about 45 minutes, and you can bring your food and drink on board. Just make sure you go to the bathroom first! Most of the other rides at Universal Studios are virtual reality. There was The Simpsons Ride, Minion Mayhem from Despicable Me, and Kung Foo Panda, which we all went on. I did have to cover Mr. P’s eyes on most of the rides, but really he could have just closed them and been fine. That’s the beauty of virtual reality. There’s also an area of the park that’s designed to look like the amusement park from Despicable Me called Super Silly Fun Land. There are carnival games, and a ride called the Silly Swirly Fun Ride. It was perfect for the twins. There was also a splash pad. It was a little too chilly in December, but would have been fun during the summer when you could just air dry afterwards. In addition to the rides, we hit too shows during the first day. The boys loved the Animal Actors Show, where they had cats, dogs, chicken, and rats running around on a stage doing tricks. They also loved the Waterworld Show. Of course, they wanted to sit in the “Splash Zone,” but we saw it at the very end of the day, and we didn’t want to be soaked for our walk home. They were still entertained by all of the pyrotechnics. Since we still had another day at the park, we decided to call it and walk home. Our second day at Universal Studios started just like our first with one exception: The crowds! Our first day was on a weekday (Friday), but our second was the weekend, so even though we arrived at park opening, there was a noticeable difference in the amount of people. We weren’t that concerned, however, since we did most of what we wanted on the first day. So, it was still a stress-free day, which is how all vacation days should be. Since we didn’t hit the lower part of the lot, where the Revenge of the Mummy ride is located, I took the twins there first. Mr. C and my husband wanted to take one more ride on the Harry Potter Forbidden Journey, so they met us when they were done. Getting down to the lower lot was almost like a ride itself! You have to go down three separate escalators that are enclosed in glass tunnels. The twins loved them. 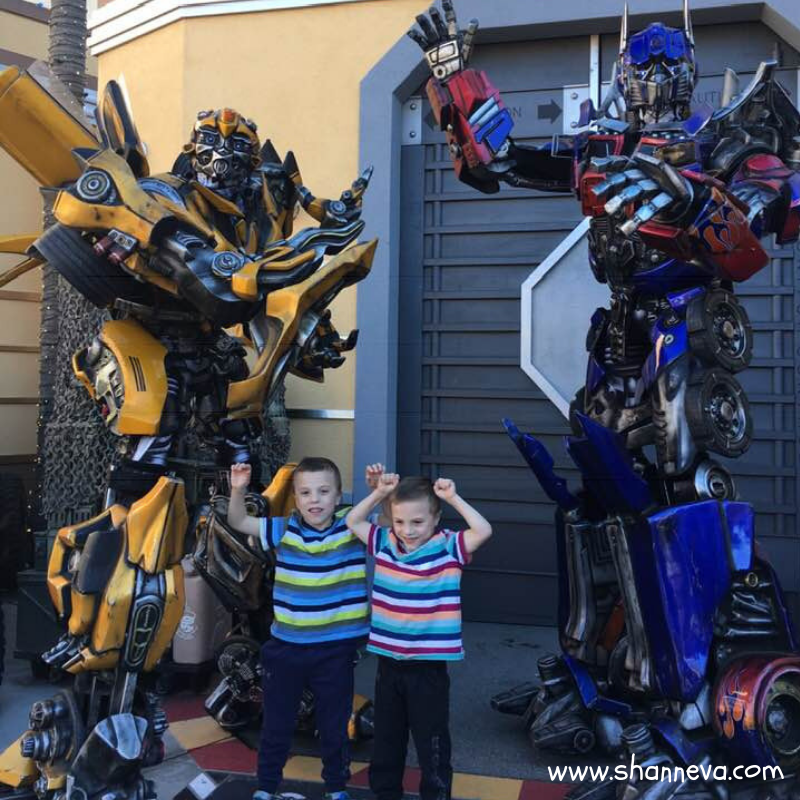 As soon as we got to the bottom, we found the Transformers! Mr. B and my husband went on Revenge of the Mummy (must be 48″)and then we all went on the Transformers ride (must be 40″). We left the park and headed back to Citywalk for lunch. My Aunt, Uncle, and Cousin came from Ventura to meet us, which was so nice. This was their first time meeting the twins! We had some nice conversation, wine, and a nice break from the crowds at the park. 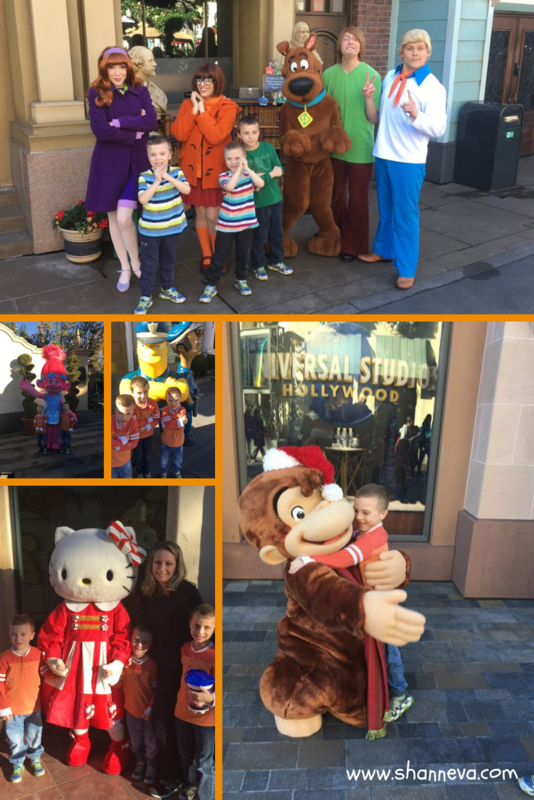 On both days, the boys got to meet a ton of their favorite characters. Unlike Disney, they still wander freely around the park. Sometimes there’s a line, but most we just walked right up to. I even got to meet my favorite character! Can you guess which character is Mr. P’s favorite? 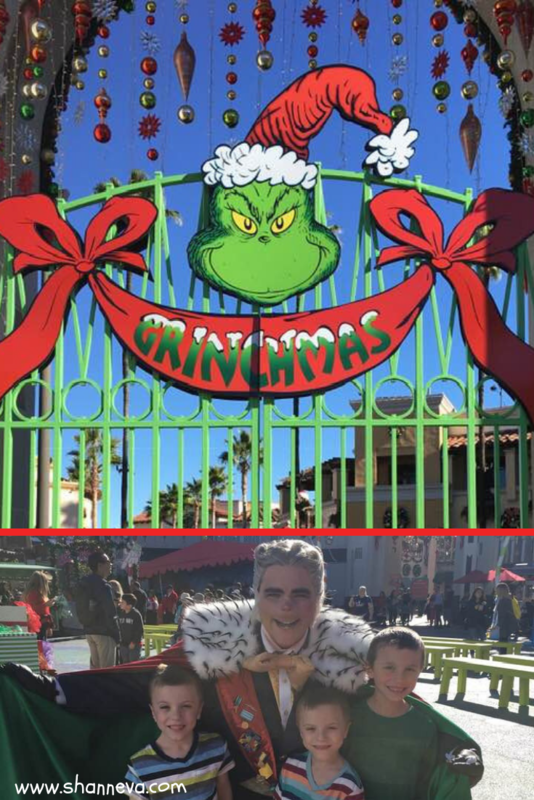 Finally, we explored Grinchmas back inside the park. It was a seasonal attraction for the holidays. There was a giant tree, an appearance by the Grinch himself, and a really cute show put on by the Who’s. The boys also got to mail a letter to Santa. Then, we went to a show we missed the first day called The Special Effects Show, all about Hollywood magic. My husband wasn’t a big fan because he thought it moved slow, but the boys liked it. We also went on a few of the rides we really liked the first time like the Simpsons and the Swirly Whirly Fun Ride. After an exhausting, but super fun day, we made the final walk back to our hotel. I’ve been to Universal in Florida, but it was MANY years ago. I think it would be fun to go now, especially with my kiddo. He’s also less of a Disney person so I think he’d really get a kick out of Universal. It sure looks like you guys had a great time there! How fun!! I’ve never been to California/Disney Land but I REALLY want to visit the Wizarding World of Harry Potter in Florida someday soon, as I’m a huge fan. OMG, I am LOVING all of your pictures! 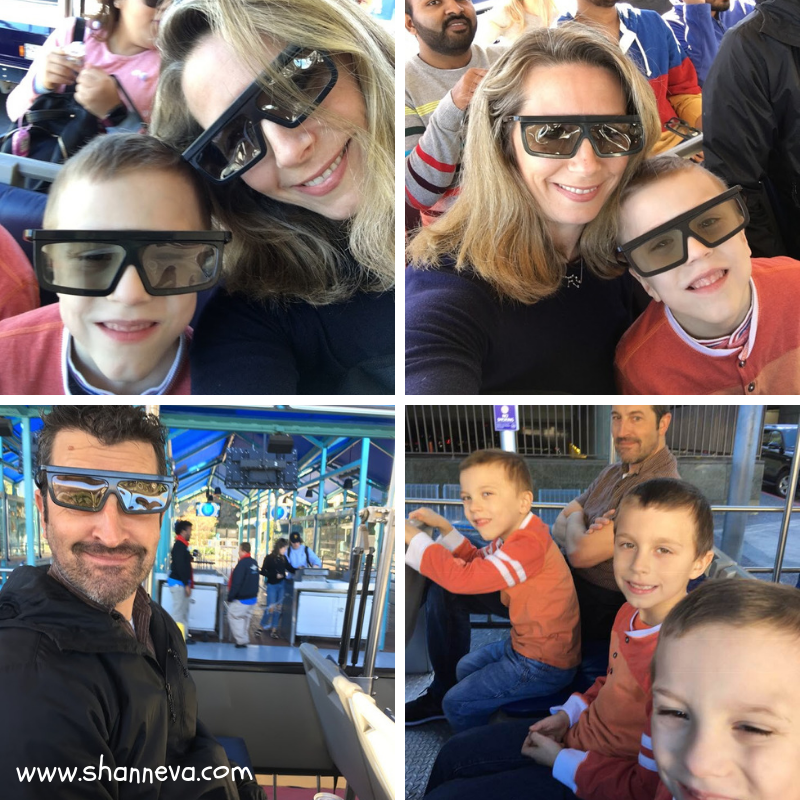 It looks as though you had an absolute blast with the family, and glad that the kiddos were able to experience so many of the rides. The virtual reality stuff really is neat, eh? And I like that if it gets too much, you can just close your eyes 🙂 I am actually a total scaredy cat and am terrified of roller coasters, too. My brother’s gf dragged me on a kiddie coaster and she couldn’t stop laughing when we got off and I said that it was the most terrifying experience of my life 🙂 LOL!! I would love to visit the Wizarding World of Harry Potter. It looks like a lot of fun.